Dear Y: How your MoonDoggie Base ARG expanded, and ended. In a previous story we described how we introduced you to MoonDoggie Base, an Alternate Reality Game to make your bedtime prep easier. In the year that followed we came up with other uses for your ARG. 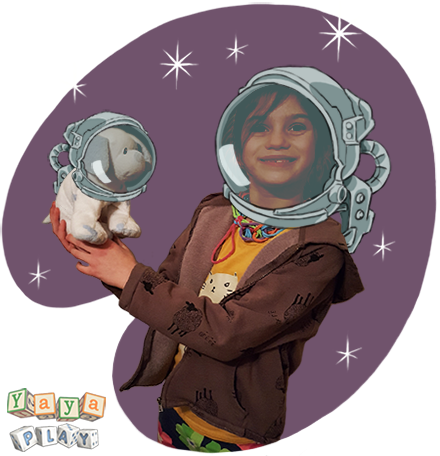 Each story kept your beloved Baby Doggie stuffy and her friends safe and happy, and reinforced the idea that any mundane task could be an adventure, up until you were done. We returned to MoonDoggie Base for an hour one afternoon while your mom napped. We did the very important work of sorting and folding laundry which, as I explained to you, was actually sorting and preparing supplies to rocket up to the MoonDoggies. You decided your own clothes were the food, the sheets and towels were the water, my clothing was games and Mom’s were toys. All were to be sent up from Earth as a care-package. The urgency was the MoonDoggies were REALLY hungry and if we did not do a good job of sorting the supplies they would most certainly try to eat the toys or drink the games. As we organized the four main piles we discussed separating your clothes into food types. So your pants were peanut butter and banana sandwiches (my daughter, our Elvis) and your pajamas were pancakes. Your socks were cucumber and cream cheese sandwiches, and we constructed each sandwich by making matches. We carefully folded the water supply (sheets and towels: you decided kitchen towels = drinking water, tablecloths = bathing water, bathroom towels = “splashing around” water) and delivered each package to where they belonged on MoonDoggie Base. Then you unfortunately woke your mom with the excitement of having delivered the packages. A few weeks later we spent an afternoon dealing with the extensive book collection piled precariously on your shelves. Organizing these books became working on the MoonDoggie database, looking for the stories you really wanted the MoonDoggies to hear. We created urgency by saying the MoonDoggies were crying for bedtime stories, but they did not know what to read because of the big jumble. This premise eventually backfired. I suggested there might be books you no longer needed: Books for much younger kids that you hadn’t opened in years. You made a counter argument I could not refute; you might not read them but they were perfect for MoonBabyDoggies. We finally convinced you to let us prepare them as a care package to the MoonDoggies at Goodwill. A winter storm meant I was home for three weeknight bedtimes in a row, and you asked for a Wastronaut adventure for each. We came up with something new and repeatable the first night, with an intense ticking clock. “The Nom Noms are invading!” I exclaimed. You asked what a Nom Nom was, and I held up a sideways fist and made munching motions with the thumb. I explained a whole herd of Nom Noms were flying through space on Solar Winds to eat the MoonDoggies. They have just passed Pluto and are heading to Neptune! You wanted to know what we could do, and I suggested that, while the Nom Noms are blind, they have VERY good hearing, and we could make them fly away if we recorded a noise they did not like and built a transmitter. You already understood the pattern, so you asked what the toilet time was for. Washing hands was building the transmission tower. The Nom Noms passed Jupiter. Washing face was configuring the signal dish. The Nom Noms passed our asteroid belt and headed toward Mars. While I put toothpaste on your brush you reported our progress to the MoonDoggies via radio transmitter: The tower is up! Hold your ears–here comes the signal! Just as the Nom Noms reached our Moon you opened your mouth superwide and allowed a thorough brushing while making a sound something like a car alarm. I reported on the hasty retreat of the Nom Noms past each of our planets and away out of our solar system. You let me brush your tongue to turn the sound off so it did not hurt the MoonDoggie ears and we entered your bedroom to offer ceremonial speeches on the masterful and timely defeat of the ravenous predators. Less than 10 minutes. Hurray for ticking clocks! And repeatable. An asteroid evidently knocked out the tower we built the first night, so we needed a new process the next bedtime to turn away an invading flock of Kinards (two hands making alligator mouths). And the next night, when the planet-jumping Oobrums (wiggly devil-ears) tried to attack we discovered the tower had been eaten-through by space termites. They just don’t make transmission towers like they used to. After about 8-10 months of occasional use the game stopped working as a way to move bedtime prep along. You might be excited to start, but you would lose focus half-way through, and we moved on to other ideas. I might try to bring it back someday, perhaps with you writing the scenarios yourself. Even if we never play it again, I will always recall fondly going to space with you, and the pride I felt standing by your side on MoonDoggie Base as you explained to them, night after night, that they were safe under your care. “Thanks for sharing your ARG. As a parent, I have to say that a 15-20 minute bedtime routine seems well beyond amateur class. You guys are doing great! "Your story got me thinking about games where the characters not only have different goals, but are playing from totally different belief systems about what it means to play and win. Most games have the standard good guys and bad guys who are at odds, but in your game the player objectives are completely different. Your objective is to make bedtime routine go quickly and smoothly while accomplishing certain goals. Points for smooth, points for speed. Your daughter’s objective is to engage in engrossing imaginative play that stimulates her mind, body and spirit. You could win for speed while your daughter loses for lack of play. She could win for play while you lose for speed and smoothness. You could both lose (one of THOSE nights) or in the case you described, you could both win. I find it interesting when two people play together and one has a goal of getting from point A to point B and the other person couldn’t care less about getting anywhere. Many cooperative games feel contrived and condescending, but this one is self correcting because as soon as you start to overly manipulate it for speed, you’ll find yourself losing. Only 3 days left in the Hasbro contest and our Indiegogo for our cooperative math card game, Monsters in the Elevator. Check us out and get a copy for your family! Dear Y: The Games You Devised to Dress For Kindergarten. At five-years-old you spent a lot of time playtesting the tabletop games created by my students, and you bombarded me with questions on Game Design principles. You were especially interested by the concepts of “good failure”– that mistakes could be funny or exciting– and “unnecessary obstacles”– the idea that an ordinary task becomes more enjoyable if we make it harder to accomplish. Everything we did could become silly, and therefore fun, when we added extra steps and challenges. We cleaned your room walking only backwards, or saying “grilzabliff” after every 5 things we collected, or with our eyes closed (which was least productive, and most fun). At six you started kindergarten, with an earlier and tighter morning schedule than you ever had before. We needed to motivate you to get dressed quickly and efficiently. So we made games. You were less happy at this age in having the games imposed upon you. You wanted to be the inventor. You suggested many ideas, and I explained which ones would take too long, and so needed to be left for the weekend, and which we could try on weekdays. The most efficient was “Clothing Inspector” where you tossed me an item from your bed, I caught and threw it back, and you caught and put it on. A longer version we called “CatchMeCatch,” where you threw the item, and then leaped into my arms yourself. I was then charged to dump both you and the item onto your bed, where you dressed. Slower but extra satisfying were the academic dressing games. As your literacy grew you had me name words for you to spell before donning each piece. With each item the words got longer and harder. If you got a word right the first try, you put the clothing on at normal speed. A first mistake (usually to do with the ridiculousness of English) meant you had to put it on more quickly. A second error meant you had to do it VERY quickly. You particularly liked it when the words “built up”: At, Ate, Late, Later, etc. The math game was similar. I built on your current level, starting with the double-digit sums we had practiced for months (12+12, 20+23), moving to your recent interest in single-digit multiplication (x2, x3, x5), and ending in your new willingness to try simple division (9/3, 40/4). Mistakes were made safe, and almost every day I got to hear you ask for more math. The most polished game experience you created we called “Unnecessary Obstacles.” One at a time I hid each of your clothing items behind my back. You had to guess which hand held the item. If you guessed right, you quickly put it on, motivated to get to the next choice. If you guessed wrong, you got tickled, a pretty good example of making “failure” fun. After the first few play sessions you added a point system. If you guessed correctly on the first or last item, or on three guesses in a row, you got a point. If you guessed wrong on the first or last, or on three in a row, I got a point. The essential game, of course, was to guess what the other person was going to do, and each time we played I could see you running the equations in your head. If I chose the right hand on the last round, would I choose the opposite or the same in the next? Occasionally I enjoyed hiding everything in the same hand again and again. I could see your face contort “Surely, this time he will choose the other hand?” But I waited until the final item, when you would finally decide to just go with the repeating hand, to switch it up. So many tickles! My proudest moment was when you added a further psychological dimension. You told me you were going to choose my right or left arm on the next round. We both knew you were not beholden to that choice, but it created an extra layer of Vizzini-esque possibilities; would I hide the shirt in the left hand, because you said you were going to pick the right, or in the right hand, thinking you planned to choose the opposite of what you said? Whatever the result, lots of giggles ensued. What intrigued and touched me the most about the “Unnecessary Obstacles"game was your unwavering trust. At no point in all the months we played did you ever question whether I was being fair and telling the truth about which hand held the item. For my part, through dozens of play sessions getting you dressed for kindergarten I never once lied about the hand, but I was aware of how easy it would have been to do so, and wondered that you never questioned it. Your lack of suspicion spoke to me about your own honesty. Then, toward the end of your first semester of kindergarten, you came home one day with pockets full of buttons. They were a lovely collection of shapes and colors and designs, about 40 altogether. You claimed you had permission to take them from the art room at school. This raised suspicions for us: what art classroom can afford to give up so much supplies? We did not question you about them right away, but sent an email to your teacher. We heard back later that night: you did not have permission to take the buttons. In fact, you had been instructed very clearly to the contrary. Stealing and lying. We were not happy. I recalled my own experience of taking art supplies in kindergarten. I was fascinated by a pile of wallpaper swatches with animal designs which were supposed to be awarded to kids who performed exceptionally well. I had not cracked the performance code for how to get them, and decided I would just take a few when nobody looked. Somehow, I managed to do so on the very day that my Kindergarten teacher was visiting my home for dinner. Being caught so swiftly made a big impression on me. I was disinclined to steal ever again. We hoped to offer that learning experience for you. We sat you down the next morning before school. We talked about how kids can get very excited about something and think it is OK to take it when it isn’t, and the importance of telling the truth to maintain trust. We discussed how good kids sometimes do things that are not OK. We imagined you soberly absorbing all of this and accepting the consequences– returning the buttons, apologizing to the teacher in person. Instead you threw a fit. You denied everything and cried for the buttons and delayed our work day and your school day for more than half an hour. Eventually you calmed down, copped to the offenses, and made a decent apology– to us and later to your teacher. But I could tell there would be more work to do, that your sense of truth would be iffy (as any kid’s?) for a while yet. Still, I took heart in the months that followed. Every time we played Unnecessary Obstacles, and you never questioned whether I switched a sock behind my back to my left hand when you chose right, I was reminded that you were growing up surrounded by trust. As long as you can believe in those around you, won’t you eventually feel the importance of embodying that trust yourself? Check out our new cooperative math card game, Monsters in the Elevator, made with my 7-year old daughter. It is currently a finalist in the Hasbro competition: Check us out and get a copy for your family! From ages 3-to-5 your favorite games with your mother always revolved around language. These games required no props or specific locations; they were just about conversation. Through these games she taught you a flexibility I could not imagine in my more concrete play, substituting proscribed places, objects, and activities with words woven in the air. At 3 you and your mom started a game you called “Baby.” You assigned roles: your mom might be the “father,” you the “mother,” and your stuffed Doggie the “baby of the family.” The gist of the game was speaking while remembering these roles, calling each other “mom” and “dad” during whatever other discussion might be taking place, side-by-side with whatever your mom happened to be doing. The versatility was brilliant. You could play it in the kitchen while your mom’s hands were occupied with prepping a meal, in the car while she drove, in a park on a walk. It required no hands or props and only minimal attention. You could be playing with clay or Legos or crayons, head down, while at the same time creating a story with your mother out of ever-changing roles. Frequently you yourself wanted to be the baby in these stories, and when you asked me to play I sometimes hesitated to engage. I have heard that older siblings can act baby-ish to gain attention when a newborn enters the home, but you already had our full attention as our only child, and had no baby on which to model that behavior. Even knowing how important regression is to development, like crawling after learning to walk, I found it hard to see you practice being less when every day I was so excited to see you become more. It would take me a few moments to join in, but your mom patiently played it with you every day. We wondered at possible consequences down the road: would you struggle as an adult to intuitively recognize the gendering of names in our society? Would we confuse your early literacy attempts when you eventually looked over our shoulder and saw us pronounce “h”-“e” as “she”? Remembering to make this switch always came easier to your mom than to me, but you were patient with my stumbles, and over time you seemed complicit in our campaign, enjoying the flexibility of gender in your storytelling. Doggie could be “she” on Tuesday and “he” on Thursday, and you would vigorously correct us if we got it wrong. 3. WHAT BOOK DO YOU WANNA BE? Some of your favorite games with your mother came out of the books you read together. When the stories we read to you began to include clear protagonists with goals to achieve and obstacles to overcome, you delighted in re-enacting those roles and objectives. Your mom read to you about Balto, the Alaskan sled dog of the early 1900s made famous by delivering medicine to a town of sick children. 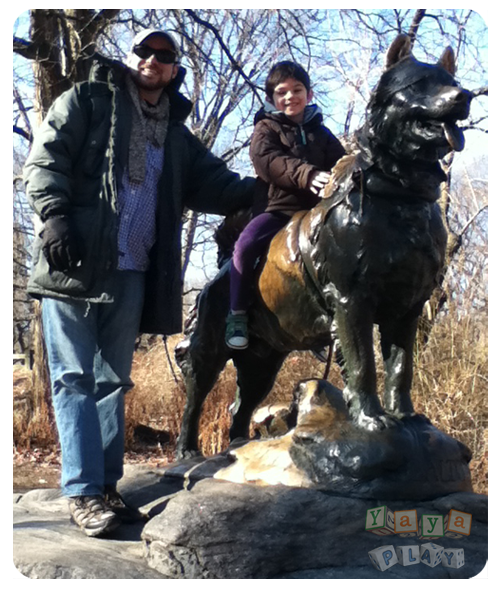 For weeks your favorite pastime was to be Balto. You got your mom or me to be Gunnar Kaarlson, the human behind your sled. You ran around our home, dodging snowdrifts and thin ice, eventually reaching your bedroom door where the other of us waited as the doctor to admit you into the sick children’s ward, victorious. You brought the game to your preschool and we got reports of twelve children running and barking in a neat follow-the-leader line. Caps For Sale by Esphyr Slobodkina had a similar effect, and your friends delighted in playing monkeys on the climbing structure to your sleepy salesperson. When your mom read you Arnold Lobel’s Frog and Toad stories, you were particularly taken with one about a mailed letter. For an entire year after, your early literacy explorations were fed by notes you “exchanged” with your mother. She wrote to you as Frog and you dictated to her your notes back as Toad. You played with the form of a note, filing pages with neatly scribbled lines, which you required we “read” back to you, as if the story you imagined when drawing the scribbles had magically been recorded in the ink. 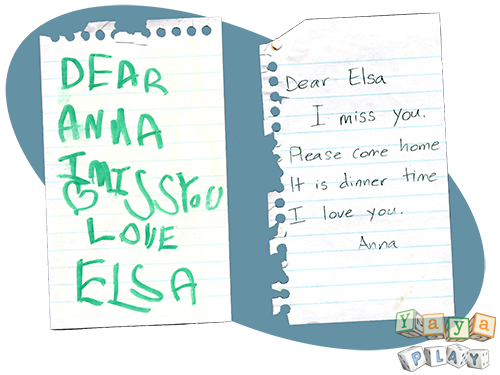 At the age of four we had still never shown you a movie, but enough of your classmates had seen Disney’s “Frozen” that the characters took up residency in your imagination. You gleaned some story elements from your friends, and when you asked to see the film in order to get the whole picture, your mom instead worked with you to fill in the gaps yourself. 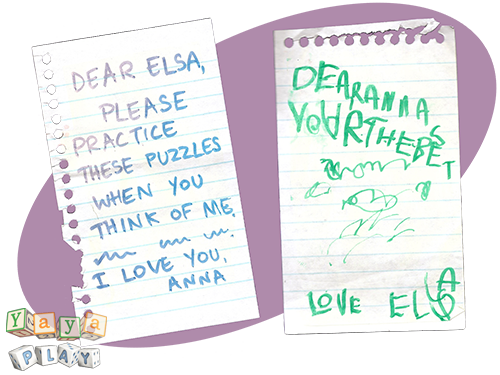 Thus the tale of Anna and Elsa took on original epic enactments with titles like “Elsa Pirate,” “Elsa Runaway,” and “Baby Anna.” The content of these bore almost no similarities with the film, and as often as not were simply a return to the “Baby” game, where instead of playing generations of our own family, we were asked to decide between Olaf, Anna, or Elsa. In this way, “Baby” survived to your fifth year. At 5, when most of your friends were gaining siblings, and despite our efforts you were not, the game of Baby demanded more attention. You were invariably the baby, and the stories you told were about your parents holding you moments after you were born, or seeing you open your eyes for the first time. You curled up in a chair, on the pile of ready-to-fold laundry on the couch, or deep under the comforter on your parents’ bed. You opened your eyes wide and wider and demanded we gaze into them, purring at that first astonishing moment, again and again. And I started to wonder: were you tending to your own heart, taking the place of the baby sister or brother you longed for, or were you consoling us? For a long time your parents hated bedtime. 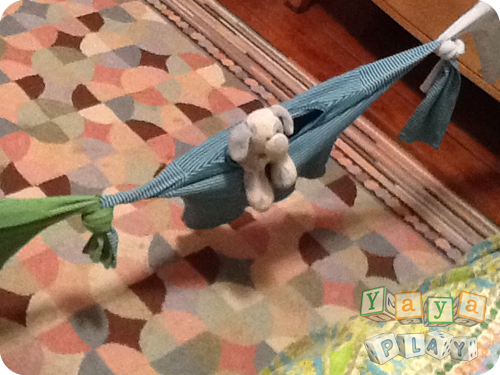 At five-and-a-half most of your days went pretty smoothly, but bedtime prep remained a challenge. Our routine for you after dinner was (1) toilet, (2) hand and face washing, (3) toothbrushing, and (4) PJs. Sometimes we would get all the way to teeth without a major fuss, sometimes it was an ordeal to even get into the bathroom. End-of-day exhaustion and a desire for eleventh-hour engagement made a volatile mix, and we often left your room after bedtime totally exhausted ourselves from the trial. We tried a LOT of strategies. 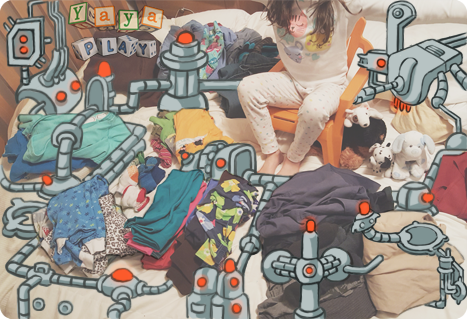 We played “Robot” (a parent stacks plastic toys according to your orders while you do each bathroom task), math puzzles, explanations of plumbing (some real, some fantastical)–anything to keep your mind engaged while we moved through the bathroom routine. Toothbrushing was always hardest; it clearly took everything you had to sit still while we stuck the thing in your mouth, and it usually led to the longest delays and blowups. Roleplay during brushing was a small success. Given your devotion to your stuffed Doggie, you agreed to be a puppy: curled up in our arms, you pant with your tongue out while we brush the upper teeth and make little puppy whines while we do the lower teeth. You can’t grab the brush out of our hands because you have no fingers, just curled little puppy paws. This worked for a while, but I wanted something that offered more overall momentum–a theme for the entire routine to carry you through with a sense of urgency. So we tried an “ARG”: an Alternate Reality Game. This winter I re-read Jane McGonigal’s “Reality is Broken” in which she describes how mundane tasks can be reframed as games to add excitement and purpose. Games like “Chore Wars” make boring household tasks enjoyable, and games like McGonigal’s “Superbetter” bring hope and even pleasure to otherwise painful ordeals. The key ideas of an ARG are to offer a voluntary mission and to reframe necessary tasks as opportunities to reach a goal. The voluntary part is important–a game is not fun and engaging if it is required. Bathroom time was not optional, but an adventure in the bathroom could be. You nodded, and I explained: “We will do bathroom time after dinner, but it will NOT be bathroom time. Instead, we are going to the moon.” I explained that there was a small city on the moon called MoonDoggie Base, where all the MoonDoggies live. You asked how they can live there without air (thank you, Magic Treehouse! ), and I explained there was a big glass dome, but that the dome was leaking, and soon all the MoonDoggies would need to put on their spacesuits to breathe because there would be no air in the city. And the most terrible thing is YOU CAN’T CUDDLE IN SPACESUITS. We needed to save MoonDoggie cuddles! You agreed. I suggested we would be called the Wisernauts, for Wiser Astronauts, but you decided we were the Wastronauts. We then discussed each of our mission parts before undertaking them, so you knew what to expect. We would take a rocketship to the Moon, and dock at the Air Control Station (bathroom). There we would sit on the Master Valve, and we needed to stay seated there for at least a few minutes “to be sure the leak was sealed.” Then we would communicate with the Air Control Computer, which on the moon is done by washing our hands and face at the Master Console (sink, accompanied by lots of booping and beeping sounds from the parent-computer). Finally, a joint mission: we stick the OxygenBrush into the Airhole and brush it around for at least twenty seconds to be sure the lost atmosphere is replaced. All of this went shockingly according to plan. We took some detours in the story, and it wasn’t super fast, but everything kept moving and you were eager for each task. Mission almost accomplished! We left Air Control Station and entered MoonDoggie Base (your bedroom). 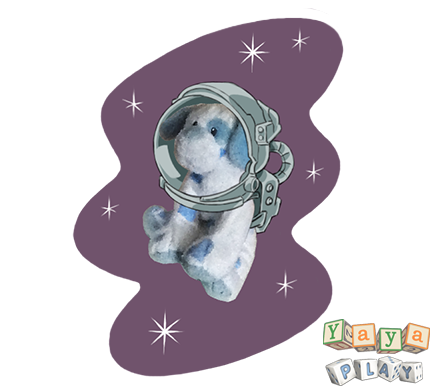 There you put on your Ceremonial Doggie Clothes (pajamas + purple wig) so you could climb onto the Central Platform (bed) and give a speech to the MoonDoggies about how you had saved them: they could take their spacesuits off and cuddle once again. Hurray! Total bed-prep time was 15-20 minutes; only about average, but smooth and happy from start to end. Next time will likely go even longer. Now that you have the idea of the alternate reality, your continued interest will depend on your input. 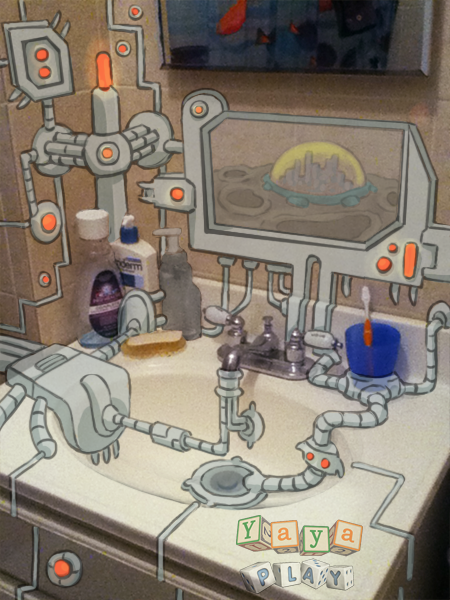 We could discuss what information each part of hand washing communicates to the computer. Is getting the soap how you access the mainframe? Is each finger you scrub a new command, which needs to be done in a specific order? I could also send you messages from the distressed MoonDoggies throughout and you could send encouraging messages back. Eventually, we could add a ticking clock for saving the cuddles: a timer to record our progress each night, to try and beat on subsequent nights and achieve a new high score. But for now, I am thrilled with smooth and happy. Our first iPad game for kids, DinoTrucks, is now updated for iOS8! Watch the trailer and download today on the App Store! You have always been a blur: running, jumping, and terrifying us by climbing structures meant for kids much older. The games we played when you were 2-to-5 were often about getting your attention as you went whizzing by. It was clear to us early on how important physical play would be to you. Sometimes to work-off energy we asked you to run circuits in our apartment–which benefited from a circular floorplan–allowing you to zip from den through dining room to kitchen, back to den and around again. Once, when you were two, I kept you occupied for a crucial hour with the task of moving our mountain of shoes from the front door to the rear, and then back again. You could only handle one shoe per trip and you beamed the entire time. You were always disappointed when other people joined our elevator and we had to stop. When told we didn’t want to bump them you wondered (aloud, and often at them) why couldn’t they just play with us? NEVER GONNA LET YOU GO: My Dad started this one when I was five. He would sit on the couch and wrap his arms around my sister and me, singing “Never gonna let you go. Never never never. Well… Maybe just this once…” and he would loosen his arms, and we would start to wriggle free, and then he would pull us in again and say “Nope nope nope. Never gonna let you go. Never, never, never.” And repeat. Howls of laughter as freedom was offered and snatched away, again and again. 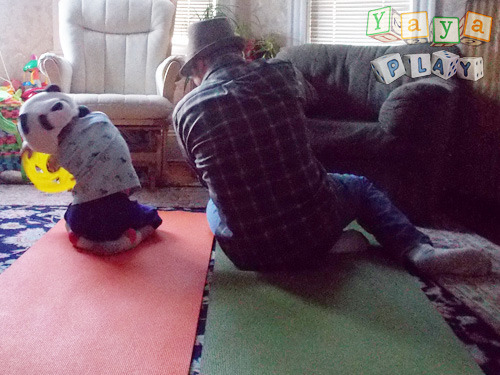 BUSY BODIES: Sometimes we matched your high energy with our own, playing chase around the apartment or “Tickle Tackle” (just as it sounds). And you completed the energetic dressing session with an obligatory victory dance. CALM BODIES: When we wanted you quieter for a meal or the approach to bedtime, we met your high energy with calmer physical games, like “Mirror”: We sat face-to-face and copied each other’s faces. Most were goofy contortions, but sometimes we talked about the meaning of simple expressions–this one is sad, this one is scared, this one happy–to practice your recognition skills. Our record playing “Elbow” was about ten minutes, if you include all the High-Fives. Dear Y: How we survive through Procedural Games. In your first year of constant growth we comforted each other with the mantra “Another week, another kid.” Every strategy for keeping you happy, attentive, or distracted seemed to last about that long before we needed new ideas. In your second year we felt enormous relief to expand this to “another month, another kid,” as our methods for getting you to eat, dressed, or seated in the car lasted that magnificent duration until we had to come up with something else. And then, glory of glories, your parents leaned to count. I remember the first time I used Counting to Three to get your attention. You were reaching for an already disputed object on your mother’s Forbidden Desk, and rather than pull your hand away, I counted: “One. Two. Three.” By Two you froze. At three your hand came down and you approached me to talk it over. I had uncovered a mystery of the universe. With this magic I could pace how long you dawdled over putting on your shirt, eating a last piece of cheesy-egg-toast, play on one last climbing structure. Often you tried to beat the clock. And behold, it lasted for nearly six blissful months. And almost as fast as 1-2-3, counting did not hold the sway it once did. We could see you were paying attention, but you tested the limits constantly. Transitions got hard again. We were poor negotiators and extended the time, so three became five or even ten. We needed to get you interested again. This stopped you dead. You turned and asked what I meant. You answered “A little rock,” and I explained that we called small rocks pebbles. And that even smaller than a pebble is a grain of sand. And then, knowing you had no context for the words but enjoying the opportunity to introduce them, I posited molecules and atoms. 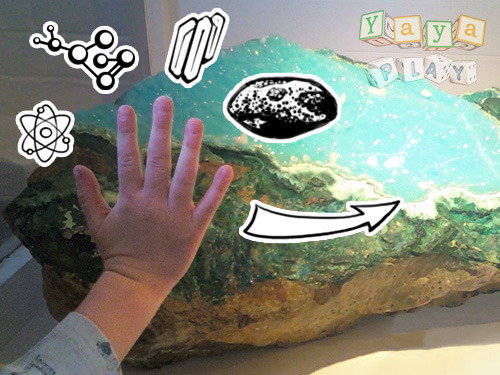 So, ticking off the five on your fingers: Atom, Molecule, Grain, Pebble, Rock. You smiled. And it worked for the rest of the afternoon, with normally teary transitions becoming serious attention with each count. That evening you decided we should Count to Flower, and the game was yours. Counting to Planets: “Sun, Mercury, Venus, Earth, Mars, Jupiter, Saturn, Uranus, Neptune, Pluto” (you will grow up to be just as disappointed as I was when someone tells you Pluto is not a planet). And, inevitably, because it is you, Counting to your stuffed Doggie: “Egg, Fetus, Infant, Puppy, Doggie” (and a predictable conversation of where babies come from). At four-years-old, however, you decided it was time you learned to drive. You set up your mom’s yoga mats side-by-side in the living room, plopped yourself in the upper left corner (clearly the driver’s seat) and invited me to sit next to you so we could “Drive to Doggie’s House.” I agreed, but told you we had steps to follow. “"First we put on our seatbelts,” and we discussed how to mime the action. Check the mirrors. Put your foot on the brake, turn off the parking brake. Put the key in the ignition. Put gear into reverse. Put your arm on the seat to twist (good stretch!) and see behind us to pull out of the driveway. Put your foot on the Gas a little bit to Go… Slowly… Slowly… now you are out of the driveway. Put your foot on the Brake to Stop. Now change gear to drive forward. Then we drove, with me supplying the sound effects for engine, brakes, squealing around turns, dive-bombing turkeys, dinosaurs rampaging across the road who needed us to stop even when they did not use the crosswalk. The Facebook pictures amused our family. They suggested you would get your license before I do. They don’t actually find that funny. Your mom’s been teaching you to cook since you could stand on a chair and swipe red pepper slices off the counter. What we do in the playground is more the story of a meal; rather than hold a spatula, you get to be the spatula. “OK, Chefs. Playground Pizza. Step One: Make the dough.” We list ingredients and knead them in our hands with big rolling motions. We flatten the result on the park slide and turn to prep the toppings. By this time, we have many helpers, so we take suggestions from everyone. LOTS of veggies. Some tricky navigation around pepperoni (we’re kosher) that I sidestep by adding sliced rainclouds, grilled lizard teeth, and magazine flakes. Everyone chops their own ingredients. We get to be the knives and then we get to be the heat in the oven, with wiggling fingers up as little flames. We take the magnificent pie out of the oven and blow– hard, harder, hardest!– and everyone gets a slice. It’s all I hoped for: 15 minutes of giggling with new playmates and shared purpose and exchanging invisible utensils, all in a structure as easy as following a recipe. And then you do something I hadn’t considered, something completely outside my plan. You wander around the playground to those who did not get to play the Cooking Game. To each you say hello, and with great enthusiasm, you offer them slices of pizza from out of your empty hands. 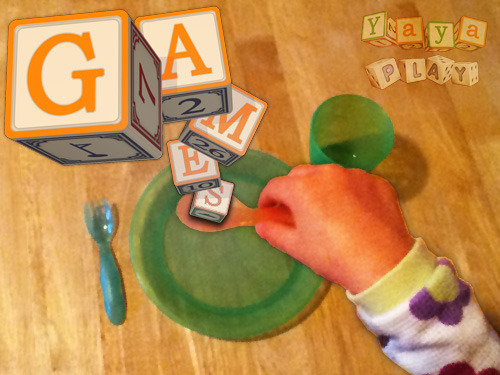 Dear Y: How we made your meals into games. We decided early on for you that mealtimes would be a focused activity. At two years old this meant you in a high chair, with your lunch or dinner on a locked-in tray, and no toys up there with you. In the grand tradition of “Here comes the choo choo,” however, we experimented with a number of games to keep you interested in your meals, and we continue to play as you have traded your high chair for a seat at the big-person table. The physical arrangement of your food was among our first games, when you were around two-years-old. Your mixed veggies of corn, peas, carrots and green beans we would separate and orient into lines. Then the race was on, with running commentary: which line will you finish first? The carrots are in the lead, their line getting smaller and smaller–help the peas! The corn needs to catch up! The peas take the lead, now the corn, oh, it’s going to be a photo finish… it’s… it’s… this Kid! The Kid wins! What do you win? A happy dance! Woo-hoo! Games of Competition are a meal category we have used–carefully–throughout your life so far. At three and four your mom would “race” you to drink water; who can finish their bottle? At four years, I issued challenges: “How many pieces of chicken can you eat while I sing this song?” I then sing “La la, flippy floppy floo” as you stuff three pieces WAY too fast into your mouth and I switch, slightly panicked, to “And now we chew, chew, chew chew chew chew chew…” and am relieved that you listen and go slower. At two we introduced you to food puppetry and suggested your meals deeply WANTED to be eaten. “This chicken nugget,” we would say, making it bounce on the tray, “is saying ‘Eat me! Eat me!’” The nuggets would get high pitched voices. The vegetables sounded like Barry White. You found the talking food reasonably hilarious, and it was usually a hit in getting you to dig in, but we felt more self-conscious about doing the voices in public. A lower-key version was to name the food. We discovered you were generally more likely to eat with fewer things on your plate at a time, but even with just three or four pieces we got the notion you sometimes didn’t know where to start. So we asked you to name them. Is this one Harold? “No,” you would say. “That one is Flurk.” OK. Does Flurk want to be eaten first? “No,” you respond, “Moodoo wants to be eaten first.” OK, which one is Moodoo? You point, and then Moodoo in in your mouth. And then the rest. We have tried songs that amount to reverse, solo games of musical chairs: as long as you are eating, we will sign a special song for that food. When you stop chewing, we pause. What were the special songs? Sometimes Elvis: “You ain’t nothing but a chi-cken, clucking all the time. You ain’t nothing but a chi-ken, and it’s in-my-belly-time.” Often the best we could manage was just repeating the name of the food again and again to a half-remembered rock and roll tune, with long drawn out syllables: We want some Chiiiiiiiiiiiiiiiii…k-k-k-k-k-k-k-en! But sometimes, SOMETIMES, we managed to get our brains around something special. My hands-down favorite at the age of three was “The Aliens Game.” The premise was simple. Mini Visitors from outer space have come to eat your lunch. What do they look like? We spent a few minutes just on that, building an appetite, and you decided on a round body, two legs, three arms (for snatching food), two heads (for eating it all), and a hundred eyes, all over its body (very hard to sneak up on). How do we know the aliens were here? Let’s look for evidence! Grilled food made it easy. Look for the black flakes on grilled red pepper: those are footprints! They have marked that one for eating. Quick: eat that piece before they get it! Occasionally, we worry about putting too much emphasis on meals. We remember our Pediatrician suggesting that an over-emphasis on any one food can cause a child to get fixated on that type for over-preference or aversion. And we have certainly seen that you now demand company for even the smallest snack, when at that moment we might be trying to get another million things ready. But there are worse things than your daughter asking for company while she eats Flurk. Any thoughts on this story? 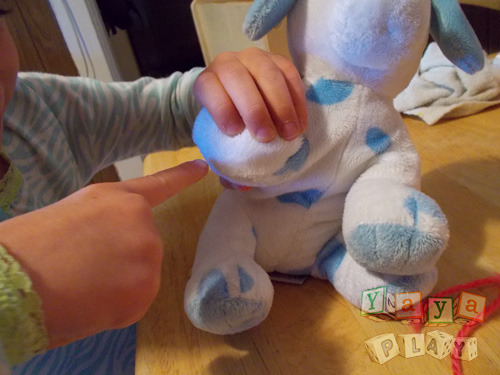 "We Do It For The Stuffies"
about the games you play! "I cannot overstate how much I love this :) "Bathroom time was not optional, but an adventure in the bathroom could be." @avantgame, on "Rise of the Wastronauts"
"One of the things that makes your parenting stories so inspiring is you never try to force your child--or even just stories about your child--into the shined-up, flawless, unreal mold that we're all supposed to think is the epitome of parenting. "You parent the child you have, and you're honest about who she is rather than trying to hide any "flaws" from view. She might never realize what a gift that is, but I think it's a wonderful way to model how to have healthy expectations of herself and others, and it's a rather lovely example from way out here, too." 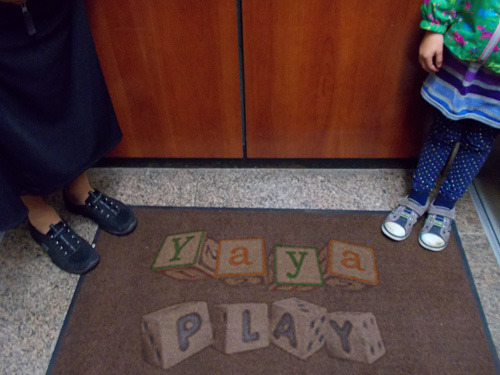 on "My Daughter Lost Interest"
All content @ copyright 2013-2017 Jason Wiser and Yaya Play LLC except where otherwise attributed.